Sucre is specified as the websites creator. Copyright sucre. All rights reserved is the owner of the copyright for this website. A profile of Cafe-sucre.net was found on the social network Facebook. The web server with the IP-address 157.7.107.86 used by Cafe-sucre.net is owned by GMO Internet, Inc. and is located in Tokyo, Japan. There are many websites run by this web server. The operator uses this server for many hosting clients. In total there are at least 160 websites on this server. The language of these websites is mostly japanese. 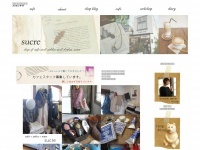 The websites of Cafe-sucre.net are served by a Apache server. The markup language of the website is HTML 4.01 Transitional. Both the inclusion of the website in search engines and follwoing of its hyperlinks is explicitly allowed.